“There was Harrison, who made his pile when Pardon won the cup…” so penned Banjo Paterson in the immortal poem ‘The Man from Snowy River‘. The ‘Cup’ actually refers to the Presidents Cup at Menindee and not the Melbourne Cup as many people have assumed. 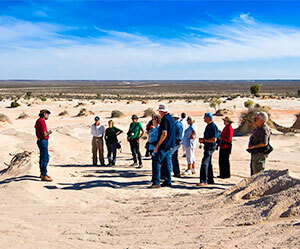 Menindee is a town steeped in legend and history for Indigenous and European culture. The area was known to the Barkindji people as ‘Minandichee‘ and it is believed this is how the name originated. Major Thomas Mitchell followed the Bogan and Darling Rivers down to this area in 1835 and came across the naturally formed Lakes which he named ‘Laidley’s Chain of Ponds; the Barkindji people referred to these as ‘Wontanella’ meaning ‘Many Waters’. 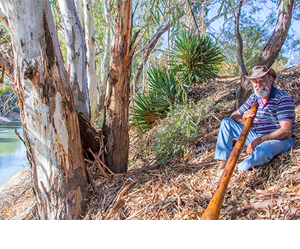 A decade later, explorer Charles Sturt travelled up the Darling from Wentworth though Menindee. Australia’s most famous explorers Burke and Wills passed through Menindee for their Melbourne to the Gulf of Carpentaria expedition. The expedition arrived at Menindee on October 14 1860, and made camp at Kinchega Station after crossing the Darling River. A depot camp for the expedition was established at the Pamamaroo Creek (a sign and cairn mark the site of the camp). Upon their departure, Burke and Wills carved an arrow in the door post of the hotel to indicate the expedition’s direction. 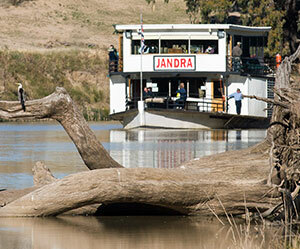 This can be seen today outside the Maiden’s Hotel in Menindee. River boat trade continued to develop the area and plans for a weir to control the flow of the river and level of the lakes to ensure river traded were shelved in the 1890’s and by the time the rail head reached the area in the 1920’s the future of the river as a transport route were doomed. 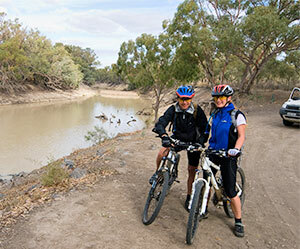 The Menindee Lakes originally comprised 9 natural ephemeral lakes covering an area of 453 km2. As a result of the weir, there are 4 major lakes Wetherell (including Lake Tandure), Pamamaroo (connected by a small lake called Copi Hollow), Menindee, and Cawndilla. For the traveller, there is great fishing and bird watching on the lakes, the magnificent Kinchega National Park, Lake Pamamaroo and Main Weir, Copi Hollow, Menindee War Memorials, the 1872 wreck of the paddle-steamer ‘Providence‘ and the self-guided heritage walk around Menindee, not to forget the birthplace of the Menindee Seedless Grapes … vineyards are mainly on the north side of town. 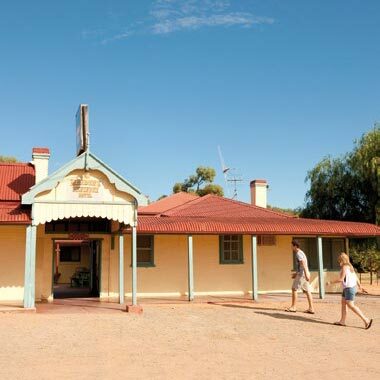 The eastern journey from Menindee takes you 128km before reaching the quaint town of Pooncarie. For more adventure and different scenery the western route takes you through the infamous Kinchega National Park and via Tandou Lake and then back through Bindara Station to follow the Darling once more.